On Sunday, June 10, you might have noticed something unusual in the parking lot of the Great Harvest Bread Co. on 9th and 9th, across the street from Pago restaurant: a little slice of Napa. Parked there was an Airstream van pulling a trailer, and on that trailer was a replica of the Silver Oak winery’s iconic white tower—a scaled-down version attached to a hydraulic lift. It’s all part of the Silver Oak Tower Tour 2012, which celebrates four decades of winemaking at Silver Oak with a 12,000-mile cross-country road trip. The tour concludes in August with the release of 2008 Alexander Valley Cabernet Sauvignon. During their stop in Salt Lake City, Silver Oak reps were decked out in black shirts embossed with Silver Oak’s clever slogan: “Life is a Cabernet.” And, on June 10, it sure was. Silver Oak’s march into Utah comes down, largely, to one person: Ashley Hale, a restaurant consultant and manager at Pago. 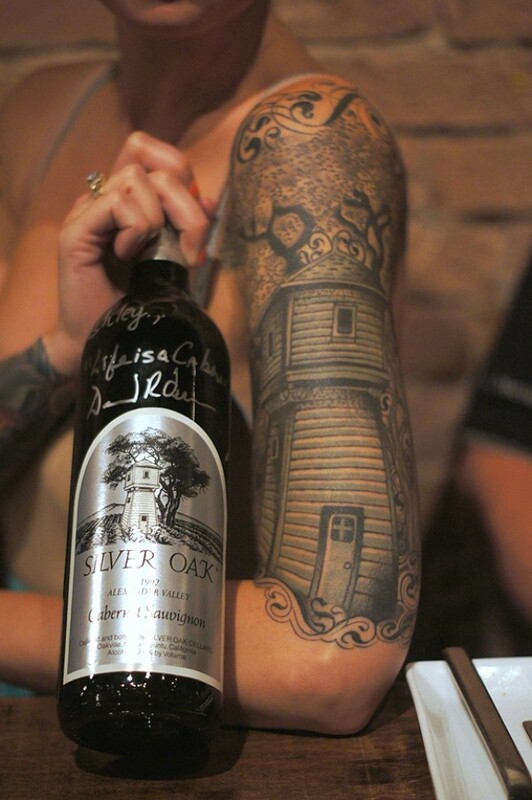 She’s also a hard-core Silver Oak fan—so much so, in fact, that she has a large tattoo of the Silver Oak tower, along with grapevines and wine barrels, on her left arm. When Hale visited Silver Oak in Napa, the folks there were, needless to say, impressed by the length to which Hale had gone to honor Silver Oak. But what she was really doing was honoring her father. Hale’s dad died as a result of injuries sustained in a motorcycle accident. Since he was a lover of Silver Oak wines—and those wines had played an important role in family celebrations—Hale decided to remember her father, permanently, with the Silver Oak tattoo. It’s quite an impressive work of art, one that took more than a year to complete. And so, the folks at Silver Oak winery are quite enamored with Hale—so much so that they included Salt Lake City on their Tower Tour 2012 primarily because of her. We kicked off the evening with some incredible Rosé made by Sonoma wine wizard Will Bucklin. It was beautiful with Pago’s fennel-infused steamed clams and yellowtail crudo. Then, it was on to the Cabernet. Silver Oak does only one thing, and does it very well: make Cabernet Sauvignon. In a world where some wineries produce a dozen or more different types of wine, it’s refreshing to see such focus. And it pays off: Silver Oak Cabernet is among the best-selling wines at U.S. restaurants, especially steakhouses. Sipping Silver Oak Cabernet at Pago—especially the 2006 Napa Valley vintage with a delicious pan-seared duck dish—was like reuniting with an old friend. I like that the Silver Oak winemakers have bucked the trend toward big, bombastic, high-alcohol, highly extracted and concentrated Cabernet—what some have called the Robert “Parkerization” of California Cab. A 750 ml. bottle of Silver Oak Alexander Valley Cabernet Sauvignon (100 percent Cabernet) sells here for $70, while the Bordeaux-style blend Silver Oak Napa Valley Cabernet Sauvignon goes for $100. Either would be a perfect addition to your dinner table. Why, you might just enjoy these wines so much you’ll want to remember them with a tattoo.